Two-factor authentication is an easy-to-use best practice that adds an additional layer of protection for your Apigee account. To log in to your account when two-factor auth is enabled, you must supply your username and password and a 6-digit number. The number is randomly generated, changes every 30 seconds and can only be used only one time to log in. This topic explains how to set up and use two-factor auth. Warning: Do not enable two-factor authentication on Apigee Edge if you publish your APIs using a Drupal-based developer portal. Otherwise, the developer portal will not be able to communicate with Edge. To learn more about two-factor auth, check out the article Two-factor Authentication Using One-time Passwords on the Apigee Community. You can enable two-factor auth for an entire organization or per individual. Enable SAML as described at Enable SAML. After SAML is enabled, you can manage all authentication policies, such as password length, password strength, and two-factor auth, through your SAML identity provider. 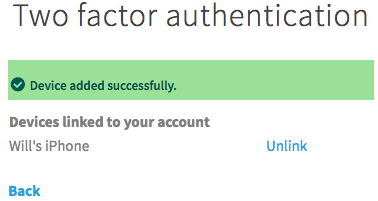 You need to enable two-factor auth in your Apigee account settings. 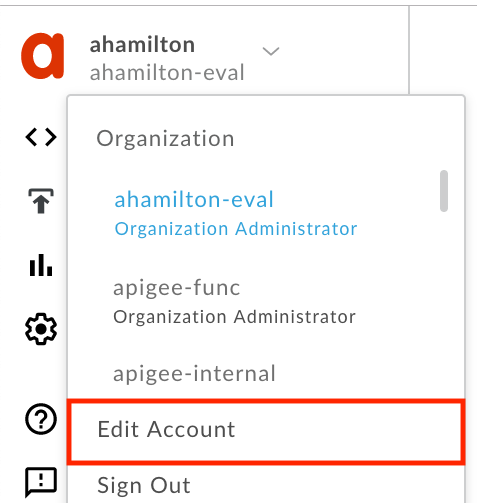 Log in to your Apigee account in the management UI at https://apigee.com/edge. Install Google Authenticator on your iPhone or Android phone. This app generates the 6-digit code you need for two-factor authentication. In the following steps, you will link this app to your Apigee login account. Click your username to open the account menu and click Edit Account. Follow the instructions in the setup screen. You'll need access to the Google Authenticator app to complete the steps. When you see the message Device added successfully, you're done! Now that your phone is successfully linked through the Google Authenticator app, you can log in the way you normally do, but you'll need to enter the 6-digit number generated by the app on your phone. Note: If you don't have the Google Authenticator app handy, you can click I don't have a code and a code will be sent to your registered email account. Go to the Apigee login page. Open the Google Authenticator app on your phone.